You can’t fix a problem that’s already happened. You don’t have a time machine. But every time you make a mistake, you have complete and total control over what happens next. Yet, time and again, when businesses mess up, their leaders blow it when it’s time to ask for forgiveness. And we WANT to forgive. We’re a forgiving society in every regard and respect. Which is why it’s puzzling and frustrating that so many people seem to have an Apology Allergy that takes a bad situation and makes it worse. Of course, in recent months, the classic apology allergy example is United Airlines. When airport police officers forcibly drag a passenger from your aircraft, you should apologize fast and without equivocation. Instead, United first blamed the passenger. Then, after they were pilloried in social media and beyond, they offered a feeble apology and admitted the flight had been overbooked. When the crowd still wasn’t buying it, United’s chief executive released a formal apology to passengers who sat through the experience. Several equally embarrassing missteps later, United executives had an epiphany (thanks to boycotting customers and partners). In a final statement, the company took “full responsibility” for a situation it admitted shouldn’t have happened in the first place. It took them days to apologize right. When an angry mob is marching your way, the natural reaction is to either run away or fight back. It’s understandable. But shouldn’t CEOs know better? Some CEOs might avoid apologizing out of fear that their words might appear to be a legal admission of guilt, but that’s a gross oversimplification of the law. Any prosecutor worth her salt knows proving liability involves more than holding up an “I apologize wholeheartedly” tweet in front of a judge. 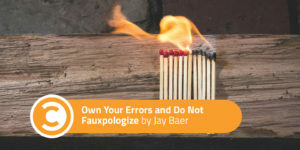 If you or your CEO enjoys conflict, you could always decide to argue instead of apologizing. This might sound like a worse option than simply saying nothing, but it happens all the time. Denis Grisak, the founder of Garadget, decided to retaliate after a customer left negative reviews of his company online. Grisak opted to sever the angry customer’s server connection, meaning the customer was effectively unable to open his garage door. Not a good plan. As bad as United’s apology was, it’s certainly not endemic to their industry, as competitor Southwest Airlines is a particularly sound example of how to apologize the right way. In 2016, a technology failure left thousands of Southwest flights—and paying customers—grounded. Instead of hiding its head in the sand or trying to deflect the blame, Southwest executives faced the complaints directly by using Facebook Live. It might seem like a gamble, but the live broadcast notched more than 800,000 views and received nearly nine times more likes than angry emojis. Elon Musk is also a great case study in how to apologize well. A Tesla driver who was upset about the wait time to charge his vehicle tweeted at Musk, and the Tesla CEO offered a direct response within 20 minutes. The apology didn’t stop there, as six days later Tesla developed a system to streamline the long lines plaguing some of its charging stations. In less than a week, Musk made a major change that benefits countless Tesla customers. He helped himself and his company come across as accountable and open to consumer feedback. Customer service and efforts to remedy mistakes are powerful tools to create devoted brand advocates. Customers are more likely to do business with companies that can solve their problems, and they’re incredibly loyal to those companies. My research with Edison Research for my book, Hug Your Haters, found that ignoring irate customers reduces loyalty and advocacy by up to 50 percent. At the same time, addressing these issues promotes loyalty and advocacy by as much as 25 percent. Even if you aren’t able to completely solve their problems, these customers will be more faithful to your company simply because you responded and were genuinely sorry. 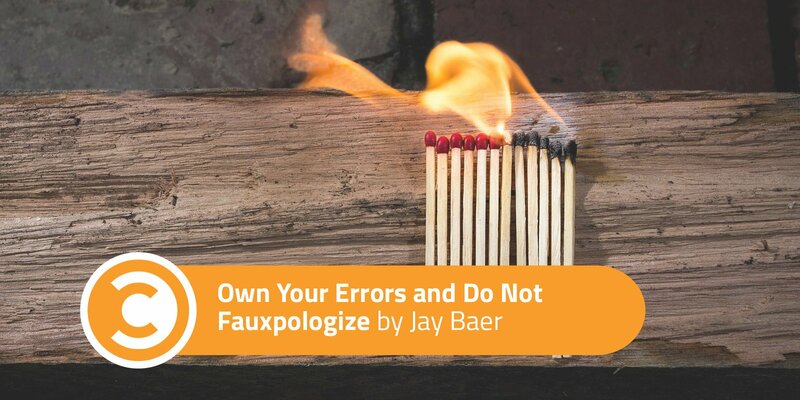 Stop looking for ways to not apologize or to pass blame or to half-heartedly say you’re sorry. If you screwed up, own it. It’s amazing how far that goes in creating customer loyalty.